Michael McFadyen's Scuba Diving - Lighthouse Drift One of the most underrated sections of the New South Wales coastline is the area around Ulladulla. Located about two and a half to three hours south of Sydney, Ulladulla is a thriving holiday town that also has fishing as a major part of its economy. The small harbour is home to numerous big (huge in fact) trawlers, including giant longliners and seinfishers. The beaches along this whole section of coast are fabulous, as good as any in NSW. 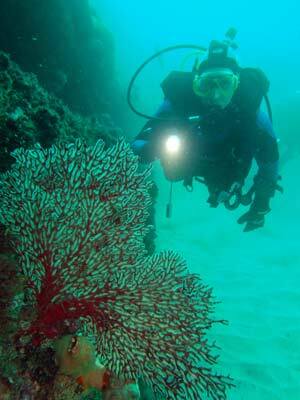 Since 1992 I have visited Ulladulla quite a few times on diving trips. On each of these occasions I have not just enjoyed the diving, I have had a fantastic time. The diving includes the area around Brush Island (The Pinnacle, SS Northern Firth), Crampton Island, Burrell Rocks as well as the area straight off Ulladulla Harbour (Home Bommie and East North Bommie). Straight below the Ulladulla Lighthouse is the Lighthouse Bommie which is a rocky islet separated from the shore by a small channel. This channel is navigable by small vessels in calm weather and looks like it would make an interesting dive in similar conditions. Our dive here started at the northern end of the bommie (GPS 35° 22' 00"S 150° 29' 37"E - using AUS66 as datum - see my GPS Page about datums) where descended on the wall. Once we descended the depth was about 18 metres on the sandy bottom with the top of the wall about 14 metres. If there is a slight current running, it will almost certainly be to the south so this will help you on the dive. The wall is a shear drop of four metres, with some small cracks and holes where smaller fish can hide. As you go you will see small rays on the sand. We have also seen huge bullrays as well as angel sharks. There are a number of moray eels in the holes on the reef wall. 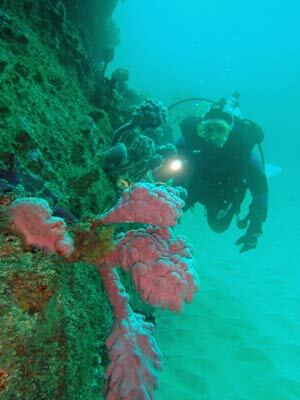 On the sides and top of the wall there are some excellent sea squirts, sponges and gorgonias. On the top there are a lot of sergeant bakers, a few red morwongs and a pile of nudibranchs. As you drift along you will see many silver sweep, yellowtail and seapike which are swimming over you. The depth stays around 18 metres for quite a long time. After 40 minutes without a current (or 30 minutes with a current) you will reach the end of the main section of wall where there are some small boulders off the now diminished wall. Without a tide you will probably have to start your ascent here. At this spot the fishlife is more prolific, with many more silver sweep, red morwong as well as a lot of leatherjackets, bream and other species. If you have a current, the depth increases a bit to 23 metres and the wall disappears completely. If you continue on for a bit the increasing depth means that you are rapidly losing bottom time and approaching the no-deco limit. After about 40 minutes you will need to start your blue water ascent. I reckon you will be fully satisfied with your dive and wishing you could stay longer. One one dive here with a slight current as we did our five minute safety stop we encountered three others from the trip and after a few minute the boat came into view over us. 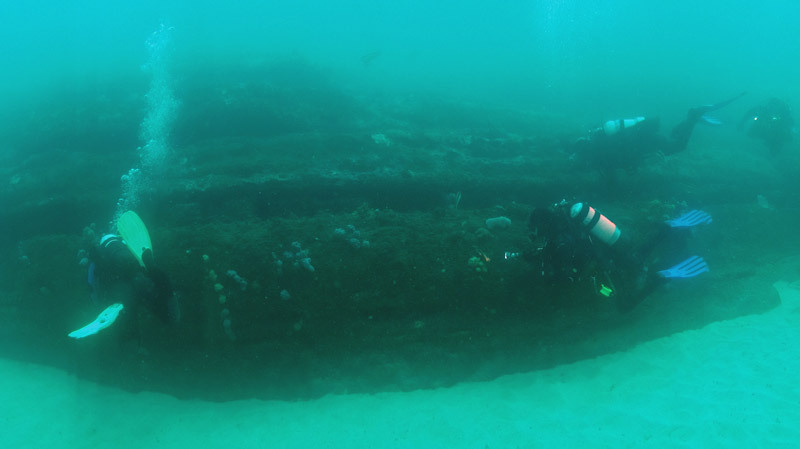 We climbed aboard and saw that we had drifted a long way and are now well off the southern end of the bommie. We ended our dive at approximately GPS 35° 22' 19"S 150° 29' 31"E. The distance from the starting point is about 600 metres, seemingly a long way but not long enough. A very good dive, with quite good visibility and water temperature of 15°C (could have been a bit warmer).